This Friday is Cow appreciation day. If you dress up like a cow and go to Chick-fil-a they will give free chicken. hahahaha... When I first heard about this I thought, "Who in the world would do that???" Well it turns out my sister and some of her buddies are going to. They are trying to convince me to dress up as well. :) So if you get hungry tomorrow and have no money dress like a cow and get free food. well you have to eat meat to do this right??? ....bummer I can't go! I LOVE LOVE LOVE Chikfila. #4 with honey roasted bbq sauce and a chocolate shake (or lemonade). MMmmmmmm I double dog dare you to do it Anna. Please post pictures too. Hi – Looking forward to seeing you all at Chick-fil-A today in full cow gear! 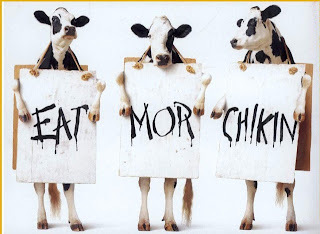 Be sure to check out http://www.cowappreciationday.com for other easy tips on how to dress to get your free Chick-fil-A! Well, There was quite a few of us that showed up and it was great! Anna, Sis. Norma, Priscilla, Korena, Sammy, Monique, London, Drea, Danielle(My cousin) and Myself were all dressed up and each recieved a few meal of our choice. It was a blast! Im glad you decided to come dressed Anna! James....Don't you remember the rafting trip last year? ?